Numerous challenges face patients and clinicians in the process of Diagnosing and treating Obstructive Sleep Apnea including access, cost and outcomes. The sleep focused services provided 1st Line Medical enable you to meet these challenges and serve many aspects of the diagnostic and treatment process to optimize outcomes and enable your practice to thrive, rather than just survive, in this environment of dwindlng reimbursement, complex Medical Policies and burdensome regulation. Sleep Medicine has become increasing complex for patients and physicians to navigate, as well-intentioned Medical Policies exert efforts to manage patient care in the manner that individual insurance companies feel is the most care and cost effective manner. While many patients may have anatomic anomalies that contribute to Airway Narrowing or Obstruction, the majority of Medical Policies specify that patients need to be offered non-surgical treatment and therapy options first before any Airway Surgery will be considered Medically Necessary. For many physician practices, this policy dictates that the patient be referred out of the practice for Positive Airway Pressure Therapy delivery or Oral Appliance providers. Once referred out of the practice, the potential for non-compliance with recommendations or disservice by alternative providers, results in fragmented patient care, and in many cases loss of the patient to proper and consistent care and long term positive outcomes. This cycle can be improved by incorporating as many aspects of sleep services as possible into your sleep practice. Providing services directly in each aspect of the patient's treatment, adherence to and assessment of, the efficacy of each therapy can be monitored as part of the patient's care. As patients proceed through the algorithm of therapies specified in their insurer's Medical Policy, you are able to deliver optimum patient care and outcomes, while maintaining the continuum if care that will make the complete spectrum of options available to the patient - including Airway Surgery when indicated. Oral Appliance Therapy has recently been recognized by most Medical Policies to be a potential first line therapy for Mild to Moderate OSA (RDI >5<30). 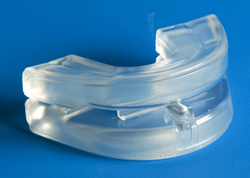 A relatively new class of Oral Appliances, categorized as Prefabricated, Custom Fitted Oral Appliances, is now available to enable practices that previously had no option but to refer patients out for expensive purely Custom Fitted appliances, to now provide an efficacious solution to this specified Therapy option as part of their own practice. Incorporating Oral Appliance Therapy into a non-dental practice for patients with no dental complications, is very easy and presents an attractive adjunct service offering to a practice. The fitting process of the Prefabricated Appliances can be performed in the office, in a single 10-15 minute fitting procedure performed by the physician or other designated clinical personnel that is trained on the fitting process. Reimbursement is available per Medical Policy limitations by most commercial insurers utilizing existing codes for claims submission with reimbursement levels presenting the opportunity to generate $1000/hour of profit with the Oral Appliance Therapy service. Coordination of PAP (Positive Airway Therapy) as part of a comprehensive Sleep Practice is also possible, but requires additional business structure to get established as a Durable Medical Equipment (DME) provider and then operate that business in such a way as to not be in violation of strict self-referral rules. As such, most practices will elect to coordinate referrals for PAP therapy to en existing DME company that has the ability to administer the therapy and provide ongoing patient management and reporting capabilities to maintain your practice as the primary Point of Care for the therapy. Any lapses or non-compliance with therapy can be promptly reported to your practice, enabling optimum outcomes and proper patient care in accordance with AASM guidelines. Additional opportunities to integrate the PAP therapy into your practice can be arranged by contracting with certain DMEs via a Patient Service Agreement, that can compensate the practice for personnel performing services regarding set-up and patient care aspects of the Therapy. By maintaining the patient relationship throughout each stage of the treatment process, an effective and consistent continuum of care is provided that helps optimize outcomes and expedite the treatment process. Practices also benefit by delivering better patient care and additional billable services. As pressures are being exerted to universally lower reimbursement levels, supplementing service offerings within the realm of current treatment practices presents the best all-around solution to ensuring both patient health and practice sustainability.